Each Timber 26 frame is hand built in small batches with double butted 7005 series aluminum tubing with a super stiff hydroformed down tube, semi-integrated 44mm head tube with inset style headset, forged dropouts, and post-mount disc brake mount. Total weight for a complete bike starts in the 21 pound range (WITH pedals) in a 1x drivetrain setup. Professional results require professional equipment. Our new Timber 26 comes out of the box under 22 pounds with best in category components including a fresh new geometry approach, 1290 gram Stans Podium racing wheels, 85 gram Ashima ultralight rotors, an extended range 11-42 cassette and our Trailcraft 152mm direct-mount cranks with aluminum spindle found on much more expensive bikes. Our end goal is to build the lightest production 26" bike with best in category frame, wheels, and component spec. 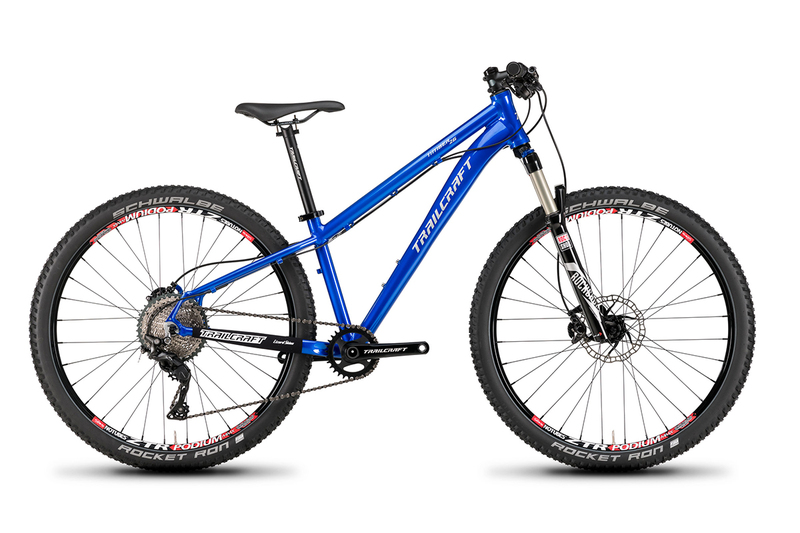 The Timber 26 is built for the natural progression and next level of riding coming off your Pineridge 24", or any 24" size mountain bike. 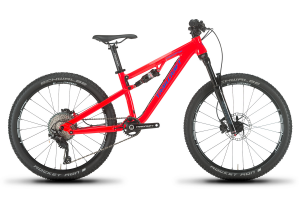 We developed the Timber 26" mountain bike to be the perfect transition from the 24" wheel size to the 26" wheel size without having to settle for an XS size 27.5" bike--or a 26_ pound bike weight! Most 27.5" bikes are just too big, long, and heavy for high performance riding coming off of a 24" wheel bike. 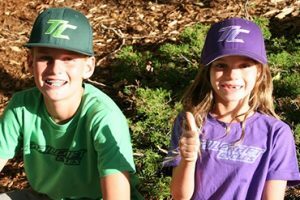 27.5" wheel height/weight increases, longer wheelbase, taller center of gravity and several other factors negate the skills your kids developed on their 24" bike. Our Timber 26 is the ideal next size up from 24" and will continue to take their riding and bike handling skills to the next level. All at about 22 pounds. 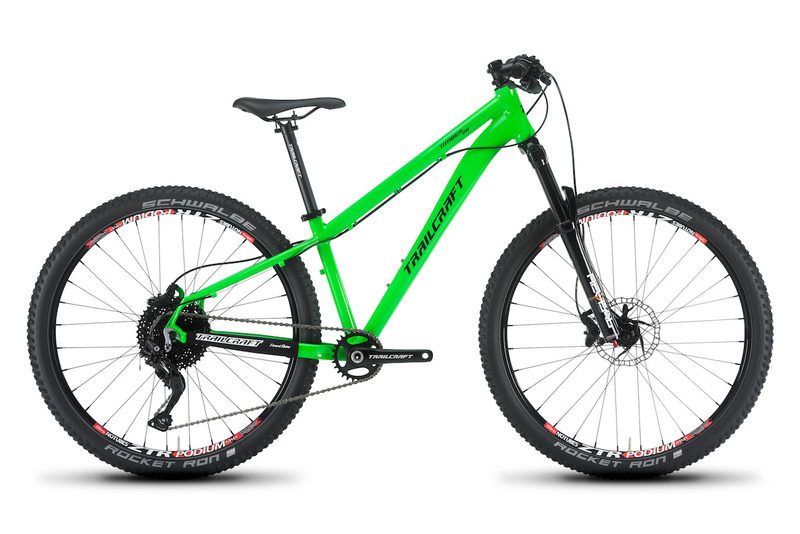 Our Timber 26 gets the Trailcraft Cycles "New School Geometry Treatment" which includes a super short yet stable 419mm chainstay out back and slightly taller front end for better control instead of a slammed super short front end now trendy on our bikes. 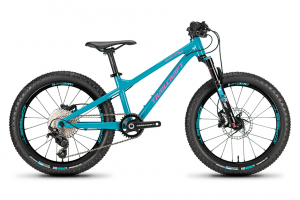 The slightly taller front end allows for more stability and control up front for fast single track riding and a super responsive rear end tracks so well allowing for quick line changes, manuals, and wheelies over trail chunder. The result is a super lightweight, fun to ride bike that will take your young riding partner to the next level in their early riding career. ALL level bike builds get our new lightweight 152mm Trailcraft Cycles aluminum spindle direct mount cranks with your choice of 26, 28, 30 or 32 tooth narrow-wide style chainring. Choose 26 or 28 tooth if you are riding steep hills and lung burning mountains. Lower elevation levels or flat areas are fine with a 30 or 32 tooth chainring selection. Like our Pineridge 24 bike, all Timber 26 models feature an 11-42 cassette for maximum climbing gear range while keeping weight low. Yay! Most adult bikes don't even offer this level of configuration out of the box! For more detailed information please click on Features, Specifications, and Geometry. The 2018 Timber 26 has it all - a high performance "new school" 24-inch frame geometry, super light weight components, and 5 cool color options to choose from. Life is too short to settle on one color when options present themselves now! We invite you to custom build your kids dream 26" bike! Each Timber 26 frame is hand built in small batches with double butted 7005 series aluminum tubing with a super stiff hydroformed down tube, semi-integrated 44mm head tube with inset style headset, forged dropouts, and post-mount disc brake mount. Total weight for a complete bike starts in the 21 pound range (WITH pedals) in a 1x drivetrain setup. What sets the Timber 26 apart from the rest is a "new school" style geometry with a short 419mm chain stay length and a tight wheelbase for a super fun and playful bike just like our Pineridge 24. This shorter rear end allows kids to corner faster, change direction quicker, lift the front easier allowing manuals and floating the front end over obstacles much more fun. 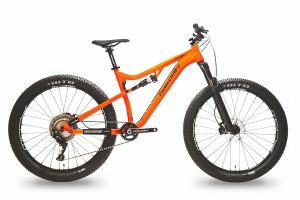 It's way more responsive than your typical 2008-era 26" hardtail you might have owned with 445mm chain stays and a super steep 71 degree head angle! Stans Podium Custom 1290 gram wheelset features superlight 370 gram hubs laced to 26-inch Stans Podium rims totaling just 1290 grams. Ashima 85 gram rotors have been spec'd to keep wheel weight as low as possible to keep performance levels high through lowest possible rotational weight. The super low rotational weight of this wheelset is very important to young riders just starting out, or more experienced riders working to get to the next riding level and next step up on the podium! This Pro level wheelset features Schwalbe Rocket Ron 26-inch Performance series tires. These tires have a folding bead, come in at a low 450 gram weight, and have great tread which excels in most conditions tested from hard pack to rich loamy dirt. Stans yellow tape is factory installed so all you need is sealant if choose to go the tubeless route to shed even more weight rotating weight and puncture resistance. Pro XT Shimano M8000 - 1x11 component group featuring Shimano XT rear derailleur, XT 11-42 rear cassette, XT 11 speed rear shifter, and XT front/rear brakes. A true and complete XT M8000 level package to keep weight low and performance high. NEW IN 2017 is our custom 140mm Trailcraft direct mount 1x crankset with ultralight aluminum spindle and 26, 28, 30 or 32 tooth narrow-wide style chainring YOU select to create the best bike for your terrain. Pro Deore M6000 1x10 group adds a Sunrace 11-42 wide-range cassette with 42t alloy cassette cog to keep weight low. A true and complete Deore M6000 level package to keep weight low and performance high. NEW IN 2017 is our custom 152mm Trailcraft direct mount 1x crankset with ultralight aluminum spindle and 26, 28, 30 or 32 tooth narrow-wide style chainring YOU select to create the best bike for your terrain. Special Build Level 1x10 components featuring Shimano Deore M6000 rear derailleur, Sunrace 11-42 rear cassette, Zee 10-speed rear shifter, and Shimano 396 hydraulic brakes. A great package to keep weight low, performance high, and the budget in check! Our Special Build also gets our custom 152mm Trailcraft direct mount 1x crankset with ultralight aluminum spindle and 26, 28, 30 or 32 tooth narrow-wide style chainring YOU select to create the best bike for your terrain. TIRES Schwalbe Rocket Ron 26x2.1" Schwalbe Rocket Ron 26x2.1" Schwalbe Rocket Ron 26x2.1"
Bike is working out perfect, figure I got about 6 months before he leaves me on the climbs! Bike weight is such an advantage, I never heard are we there yet or how much longer and he was able to grind up almost all the steep climbs. Geometry is definitely dialed. Our daughter can’t believe how much more fun riding is now with a light bike that fits her well. Climbs, desents, flat ground, it’s all much better to her. She made it to the top of a mountain near our home for the first time recently while riding her Timber 26. On her old bike she only made it about a quarter of the way before wanting to quit. Thanks for your effort putting together a great bike. I pulled the trigger on a Timber 26 Special Build for my 10-year-old son for Christmas. It’s a beautiful bike, well-crafted and well-designed, and my son is at least twice as fast and having at least twice as much fun. 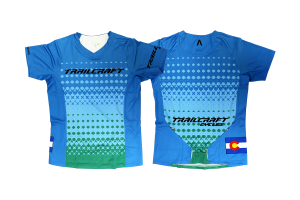 The team at Trailcraft is great to work with and provides excellent customer support. The build instructions were clear and easy to follow, and the build-up was easy, even for a non-wrench like me. All in all, great product, great service, great experience. Thank you. Have had the bike for 2 months now and Sterling has put over 250 miles on the trails around Ft Ord and Central California. We went with the special build and then switched out SPD clips. Other than that, nothing was upgraded. The bike itself is a gorgeous orange and makes it easy to find him when we are out and about. Constructed well, it is lightweight and uses standard sized components so we can upgrade components easily (e.g., larger front chainring as he grows or upgrading to more powerful hydraulic brakes). Love the Rocksox 30 Gold fork and its ability to adjust for lightweight kids. 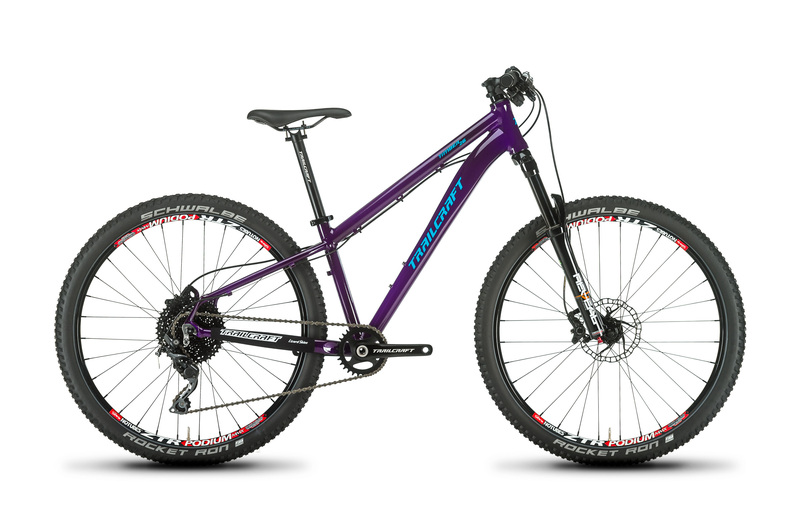 Since Sterling uses the bike for general riding and also to compete in MTB XC (12-16 mi at 90-110 min per race), this is a great choice that provides solid quality, lightweight components which are critical for this age group. Sterling likes the ride itself and his climbing has noticably improved since upgrading. Follow-up with Brett is what I love about small, speciality builders. And knowing the bike will retain its value makes the higher entry price well worth it. 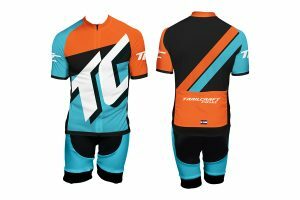 Lastly, we saw Trailcraft last year at Sea Otter Classic and I was heistent to pull the trigger on a more than entry level price. But after signifiant research (there are only a few specialty youth bike mfgs and he owns a high end cross bike from one), seeing how much enjoyment the bike provides Sterling, and knowing that two bike shop mechanics highly recommend Trailcraft, this was one of the best investments we have made. Well….COMPLETE game changer! Never have I seen a piece of gear change someone’s ability to do any sport so much. Brett set it up tubeless, and it came in a touch under 22 lbs for a special build. First ride was on the front range, and I quickly realized that I now need to ride! The geometry is absolutely dialed. My son is now extra excited about riding, and wants to get out every weekend. Last weekend was a front range 12 miler. I can’t sing enough praises for the bike, the service and overall quality. I have waited 6 months (a bike season in Maine) to write this review to really test out the bike. I am really glad I bit the bullet and bought this bike for my son!! One of my best purchases ever. I did not realize how easy it was to customize a build until I emailed Trailcraft and got an immediate response from the owners. I bought the special build but upgraded to a lighter rear cassette and opted for the RST fork- it came to 22 pounds. We live in Maine with lots of rocks, roots, and climbs which the Trailcraft is well suited for. My son has truly enjoyed riding this bike! His climbing ability, in particular, has increased substantially and he is developing a true love for cross-country mountain biking. Thank you Trailcraft! Awesome bike and great customer service. You cannot go wrong with this bike- it is very much worth the money! Thanks Trailcraft for making a great frame! I was able to hang some quality parts we had in our garage on this frame for our 11 year old son. The bike turned out light and my son is enjoying a quality fork, disk brakes, and a better steering bike than what he was previously riding. The whole package has given him more confidence and enjoyment riding. He also loved being able to pick the color of his new bike.